The Bureau of Economic Analysis will release its first, or “advance,” estimate of second-quarter gross domestic product (GDP) today. As the summation of all goods and services produced by the U.S. economy, and the basis for much other economic and political analysis, predicting GDP growth is something of a Holy Grail for Wall Street analysts, investment managers, corporate economists and other forecasters. We certainly wouldn’t want to compete with the professionals, but we will go out on a limb with this prediction: For all the attention it will receive, whatever number comes out at 8:30 a.m. (Eastern time) won’t bear much resemblance to the BEA’s ultimate read on how much the economy actually grew last quarter. Starting with the second quarter of 1996, we compared the advance estimate for each quarter’s real GDP growth with the current figures. 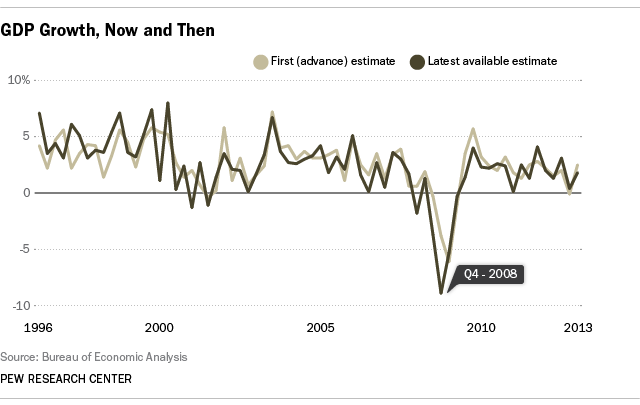 Despite a few notable misses (instead of growing 2.0% in the first quarter of 2001, GDP actually shrunk 1.3%), the mean absolute (that is, without regard to positive or negative) revision was 1.3 percentage points. By comparison, absolute revisions averaged 2 to 3 percentage points in the 1940s to the early 1960s. The mean revision, which does take sign into account, was 0.1 percentage point — indicating little if any systematic bias upward or downward. Overall, the advance estimates tracked the latest available ones reasonably closely. That aligns with the conclusions of a 2008 study, that the early GDP estimates give a fairly accurate picture of the economy’s direction, momentum and place in the business cycle. Perhaps that’s the most useful way to approach the monthly GDP report, rather than obsessing over whether a number that’s going to be repeatedly revised anyway came in a few tenths of a percentage point above or below “consensus” forecasts.